Buy: $175.0 Wild Rose by International Sterling Silver Dinner Knife 9 5/8"
$24.99 (1 bid) FRANK COBB DENMARK STERLING SILVER FISH KNIFE? SERVING KNIFE? 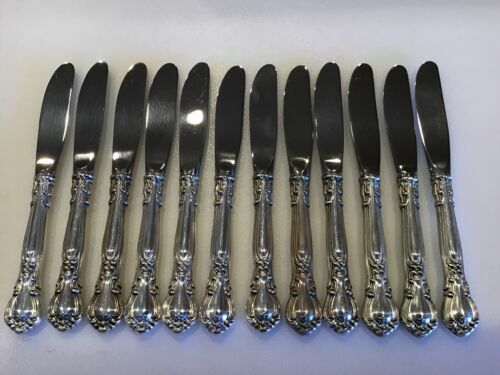 $2.95 (1 bid) Reed & Barton Tara Flower Design Sterling Silver Stainless Steel Table Knife ~! $199.0 Francis I by Reed & Barton Sterling Silver Steak Knife Set 4pc HH Custom 8 1/2"
$49.0 Louis XIV by Dominick & Haff 8" All Sterling place knives mono 1 of 4 avail. $19.99 Vintage Reed Barton Sterling Mirrorstele Handle Knife Wheat 8-13/16"
Buy: $8.0 Reed and Barton Sterling Silver Nancy Lee Regular Knife French Blade 9"
$21.71 (6 bids) 7 STERLING SILVER 'FIDDLE THREAD' BUTTER KNIVES MADE BY FREDRICK L. SMITH CO.
$17.99 Antqiue Sterling Silver Butter Knife. Very Nice! Buy: $13.75 Reed & Barton R&B Burgundy Pattern Sterling Dinner Knife 9 1/8"
$129.0 Hamilton aka Gramercy by Tiffany & Co. Sterling Silver Fish Knife HHWS 7 7/8"